Hello to all permit us share this post . This is a great mind gone. It is rather unfortunate that we cannot see what some young Cameroonains are doing and what they have in mind for their country . In 2009 I got admitted into the Higher Teachers Training College(HTTC) Bambili of the university of Bmaenda together with 70 others. In this school we always have what we called private students and official students. The private students are those who entered the school through an application while the official are those who entered the school through an entrance exam. I really discovered a group of talented individuals with a lot of capabilities and ambitions some of which were not financially upright. Among them was this great guy called TABONG KINGSLY TABE whom I always called a teacher by birth. This guy was able to produce a paint using local materials which can help a community with no markets for such products. We have been trying to raise some money so that we can get ourselves involve on this project. The use of AFRICAN materials to teach African children through illusrations and experiments thanks to our lecturer Prof Ehrner Jacqueline who made us discovered our hidden talents. 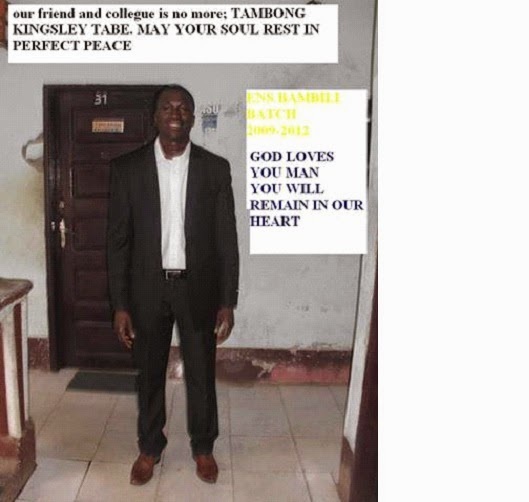 It is really sad today for me to say my friend Tabong kingly is no more. A youth is gone so abruptly. This guy had been serving his nation as a teacher ready to produce the latest generation of Cameroonians. The cameroonians will really be affected by this. WE just want to say the call of nature at times can really come as a surprise to us at tinmes. RIP BRO . To all the great minds , I encouraged you to put in more efforts in teaching and keep on creating an impact in your field. I understand that we even work now on a zero salary. We just hope that our officials will treat us better some day if not then we will treat others well tomorrow. I will take this opportunity to plead to the officials concern to take good care of the teachers who have just left school. Most of them live in horrible conditions. If my friend was working even on an allowance am sure he would have been able to take care of his health. A young man cannot go and cope in the interior where there is no light, no water, without money to buy some basic needs. Am really writing in pain because I feel so lonely now that my friend is they. Let our officials, elders all those concern take care of the youths . We are the backbone of this country. And ready to serve our country . Be a source of motivation.